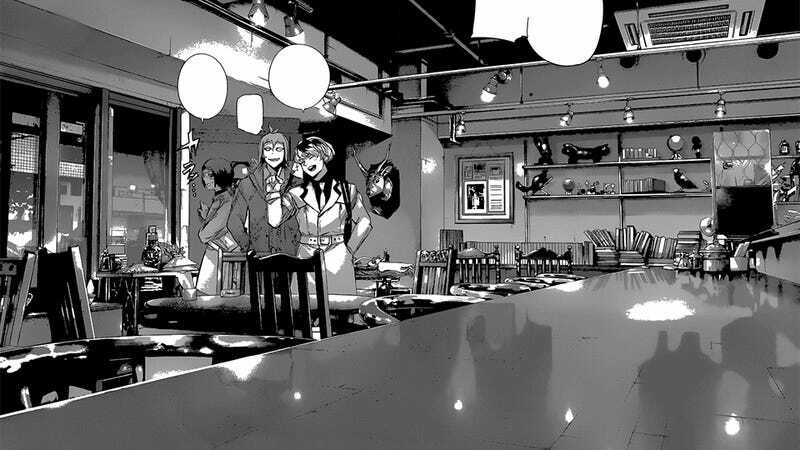 The characters of Tokyo Ghoul spend a lot of their time in cafes. The first of these is Anteku. The second is called “:re.” While only briefly seen at the end of the Tokyo Ghoul √A anime, the :re cafe is a key location in the manga Tokyo Ghoul. The “real” :re cafe is actually the Museum Cafe&diner and is located in the Ikebukuro area of Tokyo. While the cafe is just over a year old, the creators of Tokyo Ghoul chose it to be the model for the fictional :re cafe last year with the start of sequel manga Tokyo Ghoul: re (which is currently on its 27th weekly chapter). As you can see from the photos below, real life and art are nearly identical. Well, except for the outside streets which look a lot cleaner in anime form. If you’d like to visit the Museum Cafe&diner yourself, it’s only a few minutes’ walk from Tokyo’s Kanamecho metro station. Oh and if you do go, be sure to have the butter chicken curry and a banana mocha smoothie. Both are delicious.